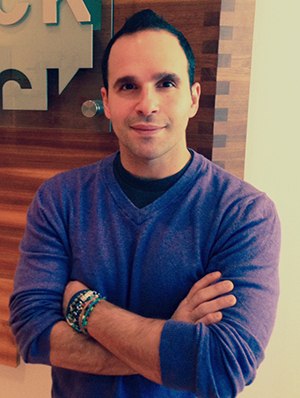 iPitch.tv welcomes Executive Producer and Head of TV & Development for Buck Productions, Jim Kiriakakis, in our latest installment of iPitch.tv's "Insiders Get Reel" series. Based in Toronto with satellite offices in New York, Kiriakakis has fanned the flames of success for Buck as they've grown to become a leading content creation company and production house with a diversity of success in television, film, documentaries, commercials, and new media. Recently entering into a deal for Four Original Series with REELZ, Jim and company have no time to deconstruct the reasons why, but just to do or die...and still indulge us with a fun chat that we're certain new creatives and producers will appreciate. Scott Manville | iPitch.tv: Jim, we’re excited to have you with us! Our producers and creators will be pleased to have your insight and experiences shared. Thanks for your time. iP: You really cut your path within the docu-style series genre going back to “Saw Dogs” with Discovery, and “Deals From The Darkside” at SyFy and A&E. Bring us up to speed on other projects you have your hands in at Buck Productions. JK: We have just locked a deal for Four Series Originals with REELZ. We are also looking at producing a couple of series for a distribution partner from the US, I am in the middle of producing/directing a digital travel series for AOL/HuffPost Canada and have a number of other branded and unscripted projects on the go. We also have scripted projects which we produced last year that will be hitting small screens and big screens this year. iP: How thirsty is the market right now? Is the general mandate getting tighter in terms of subjects, or is it still the wild west of the early “reality boom” years. JK: The market is really in a state of flux right now. There’s a lot of thought and dollars going into the digital space. As far as the traditional market I feel it’s all about how much for how little and exploring the time buys and other ways of getting shows made. For me the future is in branded partnerships and digital content and so far 2016 has been a lot about those silos. iP: When you find a project with a subject and potential content that you feel has entertainment value, what are the steps you take to package or “prep” it for pitching the Network? JK: Tape, tape, tape. You need tape to sell a project. So the first thing I do if we don’t have tape is find ways to create it or look to tap into development money to produce proof of concept etc. iP: For a new producer, or a creative from outside the industry who happens to have access to a family, world, or business that is ripe for reality TV, and they’re providing video to pitch a producer like yourself, what are some of the important things you’d like them to cover? How do they know what to capture that will communicate potential in their pitch? JK: Whatever video is being supplied it needs to be good. If you don’t have the ability to make it good be sure at the very least that it’s honest and what’s being said is gonna’ grab someone and make them pay attention. Perhaps there’s an article that gives a proof of character or the world you are trying to pitch which could engage a producer, or you have some exclusive partnership or access that triggers interest. Give me an idea of the story engines, the potential production hurdles, and the competition, tell me if the world has been covered before and how your concept differs, etc. iP: We’ve loved having you at iPitch.tv sourcing projects. What's your take on the filmmakers and creators in the mix that you’ve scouted? JK: I’ve had a great experience to date with iPitch.tv as we are currently pitching a series we optioned from creators on iPitch and I look forward to seeing the platform expand. iP: How has today’s tech made a difference in your scouting process, being able to connect with new creators and producers? JK: We have so many ways that we build out our development portfolio. Either it’s created internally, we have independent producers pitch us material, agents and distribution companies bring us pitches, and networks approach us to develop internal properties. We certainly use unique platforms like iPitch.tv that definitely offer great opportunities to find projects and/or connect with creators to develop properties together. For us projects like “Saw Dogs” and “Deals from the Darkside” came out of meeting creators through an online platform and building those projects together for the marketplace. iP: Casting is such an important facet of structuring reality TV shows. In the frustrating scenario of having a great subject or “world” for a show to pitch, but the people involved just aren’t right for TV, how do you get around that? Does a concept live or die by the casting? iP: Let’s talk production. While the development process can be exciting and inspiring with many producers and creators ultimately taking a passive role in the actual production of the show, give us the down and dirty realities of delivering a show on time and on budget. JK: Getting a show in on time and on budget is really not a secret formula. It’s about thorough development, understanding your concept and making sure that both you and network are on the same page. In the Canadian marketplace we spend a lot of time in the development space - sometimes too long - but what that does is really give us a good sense of timing and what it’s going to take to get things done. All that said, things can go wrong and in those instances you hope that you have budgeted enough in the contingency and have a great team of people that can help you execute Plan B, C and so on. iP: Take us inside the mind of a reality TV producer on the fly. You’re filming events, hopefully capturing moments, but how do you know that you’ll be left with the right coverage to piece together the story in editing? Is there a “back to 1” in “reality”? JK: It really depends on what kind of ‘reality’ and the creative behind it. Is it reality, reality comp, docu-series, lifestyle etc. As far as coverage, I always try to go for reactions the first go around so that we can grab the authentic moment and then if necessary I come back around for coverage of anything else I might need for the moment. iP: Knowing what you’d be dealing with in actual production of any proposed concept, what are a few key “must haves” in any concept you’d consider taking on? JK: For me the first thing I look for when considering a concept is 1) Is there tape? If there is no tape then it’s tough to get anything through. 2) If there is no tape, does the concept have something there worth investigating further and perhaps we get involved in helping to create tape, a lot of times this will have to do with some kind of great talent or exclusive access/partnership that is being brought to the table. 3) Is there a clear/fresh idea, story engine and/or format to take out to market. 4) The character of producer/creator who is bringing me the idea. You can have the best idea in the world but if I don’t dig your vibes then we won’t be working together. iP: You have a lot of traction in both the U.S. and Canadian markets for programming. Can you help us understand the differences in those markets from both a programming and finance perspective? JK: From the programming side Americans and Canadians are very different TV watchers and the number of channels you have to pitch to is also very different. In the Canadian market place we really only have a handful of players that are commissioning unscripted. In the US it’s obviously a much larger market with more variety in demos etc. From the financing side there is a lot to know and go through and too much to discuss here. The big thing for Canadian producers is how the Canadian market financial structures work. The network doesn’t pay 100% of the budget and you end up with scenarios that involve tax credits and other funds to help get your financing completed. The end result is that Canadian Producers retain ownership of their IPs for Global Distribution. iP: What do you have coming down the pipeline? What can we look forward to tuning in to? JK: We just sold four new originals to REELZ Channel and those will start production in 2017, a branded content travel series with AOL is launching later in July and we have a few more US opportunities we are excited about. We also have documentary, scripted TV and feature projects that will be announced over the next year. iP: What advice can you give to the new producer cutting their teeth in the pitching and producing world for the first time? And what was the catalyst for your own success? JK: You need to know your programming. Study all the channels, the shows and having a great handle on this will help you as a producer to gain a better radar for what to spend your time developing and pitching. Next, PITCH WHAT YOU’RE PASSIONATE ABOUT! The very best pitches I’ve had were always with properties I was passionate about and if you’re pitching something that you don’t love, it will show. Lastly, you need to be your own toughest critic on whether or not your idea deserves to be made. It’s tougher and tougher to do but if you find an angle that’s fresh, talent that you can’t turn down, or can create a format that feels very different, then you need to grab as many of those elements in order to sell a series. The catalyst for my entry into this world was finding a group of paranormal hunting teenagers at a time when paranormal was still very new. I thought they were awesome and I was excited to bring them to market. iP: Always great chatting with you, Jim. We’ll be looking forward to more great entertainment from Buck Productions. JK: Always a pleasure Scott and thanks for inviting me to the ipitch.tv party.